Manufactured from 1946 to 1949. 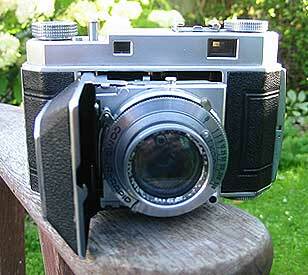 This model was much like the earlier Retina IIa type 150, but with a simplified top cover, and was supplied with either a coated Kodak Ektar f/2 47mm lens in a Compur-Rapid shutter, like the one above, or with a Schneider Retina-Xenon f/2 5cm, either coated or uncoated, like the camera pictured below. Some of the Xenons, presumably later examples, were marked 50mm instead of 5cm and these all appear to be coated. 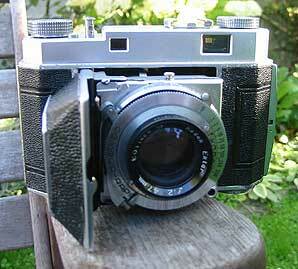 You can also find examples of this model fitted with an uncoated Rodenstock Heligon 50mm f/2 lens. The Retina II (type 011) retains the depth-of-field scale on the base of the camera, a feature that disappeared with the later Retina II (type 014).